Picking up where the first installment left off, Spider-Man 2 avoids the sophomore slump and offers up a delightful change of pace from standard comic book movie fare. Peter Parker’s stuck in a moment he can’t get out of. As a pizza delivery boy, he’s not fast enough and he can’t make the 29-minute delivery guarantee in Manhattan traffic, even with Spider-Man’s help. His editor’s not happy with him either. Since he stopped photographing Spider-Man, J. Jonah Jameson’s become more irate than usual. Poor Pete’s late for classes at Columbia University, where his grades are finding new lows, and he can’t even make it to Broadway in time to see his dream girl, Mary Jane Watson, in, ironically enough, The Importance of Being Earnest. Worn out from saving the world and yearning for the stability of the lives of mere mortals, Peter decides to hang up the spider suit. Then things start to go down hill. Hoping to bump up his grades and restore the shine in his professors’ eyes, Peter manages to secure an interview with Dr. Otto Octavius (Alfred Molina, Frida), a giant in the circles of science. Otto’s created a fusion device, featuring four mechanical arms, which will revolutionize the generation of power and allow man to accomplish feats of science previously unheard of. Otto has Oscorp to thank for his funding; the company’s now run by Peter’s long-time friend Harry Osborn (James Franco, The Company), the son of Norman Osborn, who terrorized New York City as the Green Goblin. That combination of Otto’s altruism and Harry’s greed is a combustible mix that can only mean one thing: An even more tangled web to complicate Peter’s already complex life. During their chat, Otto warns young Peter that science must be used for good, not evil. A kind man and a loving husband who struggles with balancing science and T.S. Eliot, it’s only a matter of time before Otto’s project goes horribly wrong and transforms the genius into a force of pure evil. It’s a bad time to stop being a super hero, but what can a guy do? Peter’s lost his focus, stretched himself too thin, and lost his web-slinging finesse. One of the themes of Spider-Man 2 is “choice.” We all have the power to choose our path and we all need to know the price our decisions charge, whether it’s for good or evil. After all, with great power comes great responsibility. But then again, even every day life has great responsibility, even if it is as mundane as paying the mortgage or the rent. The greatest accomplishment of Spider-Man 2 is its ability to spin a good story. In this case, it’s a story crafted by a team with an unusually strong pedigree. The screenplay, written by 73-year-old Alvin Sargent (Unfaithful) based on a story by Michael Chabon, author of the novel Wonder Boys, and Alfred Gough and Miles Millar, co-creators of the Superman TV series Smallville, emphasizes character development over mindless action. 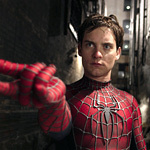 The writers have turned the tables and invested tremendously in the lead characters, Peter (Tobey Maguire, Seabiscuit) and Mary Jane (Kirsten Dunst, Eternal Sunshine of the Spotless Mind). They’ve done such a marvelous job of depicting the daily grind of these characters that the ominous activities of Doc Ock are put on the back burner until the third act. Even then, Peter’s dealings with “real life,” including his sit-down discussion with Aunt May (Rosemary Harris, Hamlet) regarding his involvement in Uncle Ben’s murder (see the first installment, dear reader), has so much well-grounded weight to it that the more comic book-oriented antics of good versus evil become something of a distraction. In addition to building an impressively strong — and complicated — relationship between Peter and Mary Jane, the rest of the ensemble gets plenty of time to shine. Particularly J.K. Simmons, who nearly stole the show as Peter’s editor in the first movie. He’s the same old crank, impossible to please and always ready to contradict himself. Director Sam Raimi (Darkman) has imbued the movie with a wonderful sense of humor that is at times broad, other times quirky, and always fun. Between Raimi’s wit and the writers’ wisdom, Spider-Man 2 turns out to be more of a treat than would have reasonably been expected. Given the movie’s emphasis on character, it still has some stunning action scenes up is red-and-blue sleeve. In particular, a fight between Spidey and Doc Ock on top of, inside of, and around a New York subway is a corker. Thanks to marginally better special effects by John Dykstra, who re-invigorated the field with the original Star Wars, the web-slinger springs to life with a wee-bit more realism this time around. Just a wee bit, but it’s enough to make the material work. The first movie was released in 2002, in the aftermath of September 11. As an all-American touch, Spidey was last seen with the American flag atop a New York City skyscraper. It was a great moment of American pride. That same spirit of resilience flows throughout this second chapter. Faced with adversity and the daily pummeling of life in the big city, Peter perseveres and manages to inspire with or without his comic book costume.